Nope, not that kind! I’m finally gotten to the point I’ve dreaded the absolute most in this journey–stims. I had cd2 BW and u/s yesterday. Dr. C came bouncing into the exam room, telling me how excited he was for me!, and wasn’t I excited too? !, and basically chockfull of the energy that my coffee-less and somewhat resentful self totally didn’t have. He was over the moon to see I had 8 follicles. I guess he was expecting way less from a gal with one ovary. Honestly, so was I. We got the unpleasantness of the u/s out of the way quickly (Dr. C does u/s so much faster than Dr. F, which I am so grateful for because they’re always always uncomfortable-bordering-on-painful for me. I freakin love this guy.). I signed more of my life away with the document/financial/legal people, and I was done! My nurse, who is a wonderful, kind, warm, compassionate lady, called me that afternoon to give me my b/w results and instructions to begin the stims. I had Nurse repeat three times to me the dosages and times for the Menopur and Bravelle I’d be taking, just to be 1,000% certain I got it right. When she said six vials of Bravelle to one diluent, my heart sorta sank: that’s the maximum dosage of Bravelle that will fit into a needle. I’m getting the mega dose. Yeah, I’m “that” patient. After some arguing (for the record, I was right) and step-by-step with the instructional video assembling/preparing everything, we finally had the meds prepared and needle ready. I’d been keeping an icepack on my belly to lessen the feeling of the needle. DH had me lie on the couch, asked if I was ready, then…in went the Bravelle! I won’t lie, it did hurt and I bled a tiny bit immediately after the needle was taken out. I’m just so grateful these suckers aren’t intramuscular anymore. 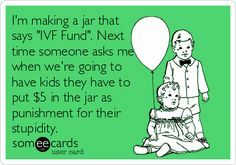 I don’t think I would’ve ever done IVF if they still were. It didn’t take long for nausea to set in. The injection was about 8pm. I went to bed around 10pm and ended up sleeping in the guest room. I was so nauseous that whenever DH moved, I could feel the movement in the mattress and would have another giant wave of queasiness. I know it’s a normal side effect and I’m hoping it subsides once my body gets used to it. Because DH goes to work so early, this morning he prepared my Menopur injection for me (a merciful 2 vials to 1 diluent). I literally opened my eyes to DH standing over my bed with a needle. I was so sleepy and out of it that I didn’t even complain when he put the needle in. Once again though: immediate queasiness. I’ve been super queasy all day since, and my abdomen near the injection sites is very tender. I’m at work now, and what I wouldn’t give to unhook the waist of my work pants and just slob out like some proud fat guy with a huge beer belly. Just wanted to let yous know that I survived my first day stimming! Happy Tuesday! Yay for 8 follicles! I’m glad you survived your first day of stims. It really does get easier, I promise! I’m so glad that you are loving Dr. C. He really is such a positive, upbeat guy. Dr. G. is awesome, too, but she is so stoic and such a straight shooter — I never left appointments with her smiling like I did with Dr. C. Dr. C performed my transfer and he was so positive that I left 100% believing it going to work (and it did, but didn’t stick because of my stupid immune issues)! Here’s to several more days of uneventful stims for you.